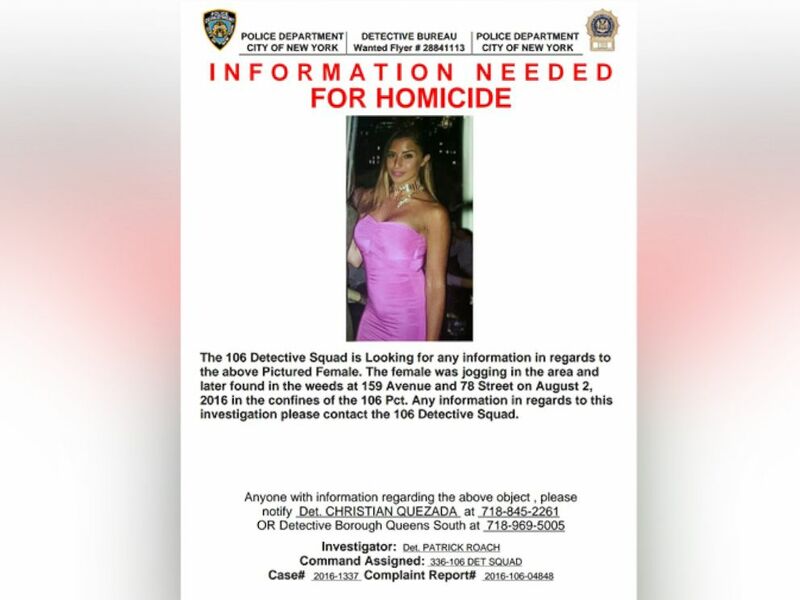 Police in New York City are on the hunt for a killer after a 30-year-old Queens woman went for a jog Tuesday and never came home. Karina Vetrano often ran on the same jogging path by Howard Beach with her father, Phil, a retired firefighter. But he was having back pain Tuesday and didn't accompany her on the evening jog. He said he asked her not to go alone, according to local ABC-owned station WABC. When she didn't return, Vetrano's concerned father went out looking for her. "You can imagine his angst at that point," NYPD's Chief of Detectives Robert Boyce told WABC. Vetrano's father was with police when his daughter was found unresponsive in the Queens marshland, a police source said. She was pronounced dead at the scene, police said. "She was a sweetheart," neighbor Joseph Dipierro told WABC. "She lit up the room when she walked in. She was a beautiful girl." Police are searching for the killer of 30-year-old Karina Vetrano who went for a jog Tuesday and was later found dead by her father. Now, police are searching for answers. Vetrano was strangled to death, the medical examiner said, according to WABC. Police said there was also evidence she was possibly sexually assaulted, WABC reported. Police have not made any arrests and a police source said the NYPD hasn't ruled anything out, including the possibility that this could have been a crime of opportunity by a vagrant. Vetrano’s cell phone was found 50 to 60 feet from where her body was discovered, a police source said, leading detectives to wonder if Vetrano was dragged from the jogging path and strangled before the suspect took her phone and tossed it. Vetrano’s phone revealed that her father had called her while looking for her, Boyce said at an NYPD briefing today. Her phone did not reveal much information, but it has been swabbed for DNA, he added. Retired NYPD Detective Sergeant Joseph Giacalone told WABC that detectives are combing through Vetrano's social media profiles for any clues. Camera footage in the neighborhood will also be reviewed.